No time to post today, because (a) I just finished a huge post over at The Fun Girls with a FANTASTIC RECIPE, that will help your skin look better than ever, (remember, it’s skin care week over there) and (b) we’re having company tonight, and I’ve got to poach a wild turkey. (Thinking about what that could mean literally fills my pun-loving heart with glee!) but I had a grand date night last night with my dear husband, The Big Bison. He had backstage passes for us to go to The Grand Old Opry. In a word, it was: AWESOME! You sacrifice a bit of sound quality when you sit in the pews onstage, but the vibe of being up close and personal with the performers is totally worth it! Sitting in our pew!!! HA! Onstage, at the Opry. 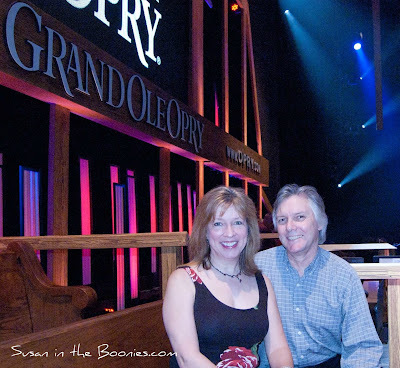 Have you ever been to the Opry? Have you ever thought you might like to go? Tell me about it!